Fonolo is pleased to announce its next expert roundtable, “How to Deliver Great Customer Service in a Crisis” on Thursday, November 30th at 2:00 PM ET / 11:00 AM PT. 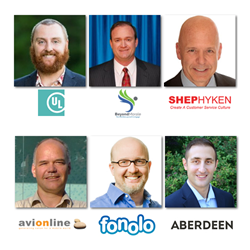 Fonolo, the leader in cloud-based call-back solutions for the contact center, is pleased to announce its next expert roundtable, “How to Deliver Great Customer Service in a Crisis” on Thursday, November 30th at 2:00 PM ET / 11:00 AM PT. News of poor customer service reaches more than twice as many ears as praise for good service. However, incidents reported by onholdwith.com show that organizations continue to struggle with managing hold times effectively. Brands who value the customer experience need to fix this problem: With the proper solutions in place, contact centers can effectively deliver high quality service, even in times of stress. Unforeseen events like poor weather, high agent absenteeism, and technical difficulties can greatly affect the success of the call center. In order to reduce the number of negative interactions that customers experience – and share with others – contact centers must prepare for the unexpected. Register now to join the interactive panel discussion on November 30th at 2:00 PM ET / 11:00 AM PT. Tweet comments and questions to @Fonolo with hashtag #CustServ, or comment on the conversation streaming live on YouTube.